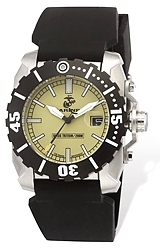 The U.S. Marines Sniper Covert Ops Tritium Watch was designed and developed by Wrist Armor for the U.S. Marines. This watch is tough enough for the United States Marines and has the key features a US Marine's Watch must have. These features include a case made of heavy solid stainless steel, easy-to-read, yet subdued, cream dial and rubber Dive Strap. The watch is water resistant and depth tested to 660 feet below sea level, and has Swiss tritium illumination for high visibility in low light or total darkness. With Tritium illumination there are no buttons to push, one glance and you know the exact time. Model XWA4637 has a cream dial, with the Marines Logo and a date window. The unidirectional steel bezel is blue enameled for easy readability. The watch has a rubber dive strap. Wrist Armor Watches are designed for and authorized by the United States Armed Forces. Wrist Armor is dedicated to making the finest timepieces for the U.S. Army, Navy, Marines and Air Force. Every Wrist Armor Watch is warranted for two (2) full years from the date of original purchase. TopFlight Watches is an AUTHORIZED Wrist Armor Watch Dealer. Your watch will be brand new, fully boxed and factory fresh! Plus, you can be absolutely certain your Wrist Armor 2 Year Limited Warranty will be honored by TopFlight Watches and by authorized dealers anywhere in the world.